global warming is not imaginary. Most scientists agree that greenhouse gases have been accumulating in the atmosphere, leading to the greenhouse effect. Greenhouse gases ( ghgs) such as carbon dioxide, methane and nitrous oxide are produced naturally. However, industrialisation has led to a steep rise in their emissions. Since they break down very slowly, these gases have accumulated in the atmosphere. The result: global warming. According to the United Nations Environment Programme ( unep ), global surface temperatures have, on average, risen by about 0.6 c in the last 100 years. The World Energy Council ( wec ), an independent research organisation, reported that global carbon dioxide ( co2 ) emissions increased by 12 per cent between 1990 and 1995.The greatest polluters, historically as well as currently, are the industrialised countries. The un predicts that even if all Organisation of Economic Cooperation and Development ( oecd ) countries (that is, industrialised countries) reduce emissions, the amount of co2 in the atmosphere would be only four per cent less than 1990 levels by 2000. To assess the role of human activities in climate change, the World Meteorological Organi-sation and the unep set up the Intergovernmental Panel on Climate Change ( ipcc ) in 1988. Its job was to estimate the environmental, social and economic impacts of climate change and suggest strategies to minimise these impacts. The ipcc and the United Nations Framework Convention on Climate Change ( unfccc) subsidiary body on technical advice reviewed the situation in October 1997. ipcc chair emeritus Bert Bolin pointed out at the meet that even if industrialised countries (listed in Annexure i of the unfccc ) reduce emissions by 90 per cent, global emissions would still be two to three times 1990 levels by 2010. This, according to the ipcc , would result in global warming of 1-3.5 c in a hundred years - probably the fastest rise in temperature in the past 9,000 years. • Heavy damage to sensitive ecological systems, which may not recover for centuries. Marine ecosystems - especially tropical coral, which grows at a slow rate - would be affected by climate change. This would impact the diverse marine life forms that coral reefs support. The ipcc said that developing countries are, on average, twice as vulnerable as developed countries, and that small island nations are three times as vulnerable. Global warming was taken up at several intergovernmental conferences focusing on climate change in the late 1980s and early 1990s. 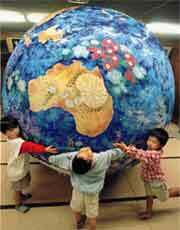 The second world conference on climate in 1990 called for a framework convention on climate change ( fccc ). Negotiations began after the un General Assembly gave its approval in December that year. And differences emerged soon after. The intergovernmental negotiating committee met five times before the fccc was adopted in June 1992 at the Rio Earth Summit. Under the convention, ghg emissions and strategies being adopted to deal with climate change can be reported by the governments of various countries.Since it was only a framework convention and the developed countries were not legally bound to their commitments, they agreed to adopt measures to return to 1990 emissions levels by 2000. It was clear that all countries are not equally responsible for polluting the atmosphere. The industrialised countries, the biggest polluters, agreed that countries have a "common but differentiated" responsibility in dealing with climate change. They also agreed, 'in principle' to transfer new technology and fund developing countries to adopt costly measures that would help combat global warming. But when countries from across the world sat together to work out a just and equitable solution at the first Conference of Parties of the unfccc at Berlin in 1995, the industrialised countries began hemming and hawing (see box: Hedging on commitments ). The North, despite the us - which had the most to lose, especially affluent and wasteful lifestyles - agreed to commit itself to a legally binding schedule for reduction of co2 emissions after much wrangling. It was a minor victory for developing countries and environmentalists. The Berlin proclamation, also known as the Berlin Mandate, became the basis for future negotiations on climate change. It placed the responsibility for setting specific targets for reduction of ghg emissions on developed nations. After the Berlin Summit, the us seemed to relent on reducing ghg emissions. At the second Conference of Parties in Geneva in 1996, the us stand appeared positive. However, at the un General Assembly Special Session in June 1997, it began harping on longer term targets for reduction of emissions even though the Berlin Mandate had called for immediate action. The Clinton administration has been tied down by opposition from the us Congress. Elected head of foreign relations for the us Senate Jesse Helms even tried to stop the government from funding the Climate Change Secretariat. In July 1997, a resolution by senators Robert Byrd and Chuck Hagel was passed unopposed in the Senate. It said that the Senate would not ratify any climate treaty which would make "new commitments to limit or reduce ghg emissions" mandatory for the us unless developing countries were also willing to commit themselves. Whatever the pressures, the us government's stand has been in total disregard of the principle of "common but differentiated responsibility" - in itself a concession by developing countries, who could have pressed for the "polluter pays principle." Rio and the Berlin Summit had introduced the concept of 'differentiation' - that is, deve-loped countries can adopt and share an overall target, but it need not be uniform for all countries. The us had all along opposed differentiation and proposed a flat rate of emissions reduction for all industrialised countries. In fact, the us had demanded involvement of Asian countries with higher growth rates - like China, South Korea and India - in any agreement on climate change. In September 1997, us automobile manufacturers, oil companies and farmers launched a us $13-million advertising blitz to convince the public that a strong treaty on climate change would result in skyrocke-ting prices. Developing countries would benefit, it was argued, while us consumers would foot the bill. However, the public held a different opinion - as recent public polls showed (see box: The runaway verdict ). But this was ignored by the Clinton-Gore administration. The us government's view that emissions from the South would equal those of the North by 2035 was highly misleading. In fact, what it means is that current emissions from the North are so high that it would take the South nearly 40 years to catch up. And yet, 15 per cent of the world's population will still be responsible for 50 per cent of the world's emission. The us, with less than 5 per cent of the world's population, today contributes over 25 per cent of the world's ghg emissions, as Clinton himself has admitted. Regardless of this fact, the us had suggested stabilising its emissions at 1990 levels as late as 2008-2012. The European Union ( eu ) saw itself as a 'leader' in the negotiations and was one of the few big players to argue for short-term targets for reduction of ghg emissions. With support from the g-77 and the Association of Small Island Nations ( aosis) , it was determined not to negotiate on the basis of the us offer on stabilisation at 1990 levels. The eu formally proposed in March 1997 that legally-binding cuts in emissions of co2 , methane and nitrous oxide be 7.5 per cent below 1990 levels by 2005 and 15 per cent by 2010. The eu had agreed on differentiated 'reductions' amongst its member states - ranging from +40 per cent to -30 per cent - but wanted to impose a flat 15 per cent reductions target on other industrialised countries.eu countries released 957 million tonnes of carbon into the atmosphere in 1996, which was - for the first time since 1992 - higher than in 1990. Most of the additional emissions came from Germany (which had a 'windfall reduction' when it merged with East Germany and shut down its polluting factories), the uk and Denmark. Interestingly, these nations are widely considered to be the three most environmentally conscious European countries. Of these, Britain and Germany can meet the eu reduction goals by simply closing down obsolete coal mines and switching to oil and gas. Among other industrialised countries, the stand of Australia, Norway, France and Japan became obvious at the eighth meeting of the Ad hoc Group on the Berlin Mandate at Bonn in October 1997. They simply refused to talk about other issues until the 'differentiated approach' was sorted out. Meanwhile, with Kyoto approaching, the British government brokered a deal between Australia and developing countries at the Edinburgh Commonwealth meet in October 1997. But the 'deal' remained ambiguous on Australia's commitments. Australian Prime Minister John Howard later openly claimed that the document amounted to a "triumph for Australia" as it did not imply a commitment to legally binding emissions reductions. The Australian government had been arguing for an increase in the level of emissions, since the country is coal rich and an energy exporting country. Instead of emissions abatement, the country wants to allow emissions to increase to "reasonable levels" (read 20-30 per cent). On the other hand, Japan's proposal for Kyoto appeared weak. It proposed a 5 per cent legally binding cut in emissions below 1990 levels by 2008-2012. It asked for flexible timetables for each country based on economic output (gross domestic product) or population (per capita emissions). After adjustments, the actual cut works out to be only 2.5 per cent over 15 years. While the eu described the plan as "not...ambitious enough", it was a clever proposal, falling midway between the positions of the us and the eu. The g-77 and China, meanwhile, had continued to stress the underlying aspects of the Berlin Mandate and opposed flexible policy measures such as joint implementation, emissions trading and emissions budgeting. Both of them had endorsed the eu target. • ghg emissions decreasing regularly from 2000, reaching a level 30 per cent below 1990 levels by 2020. It also proposed the setting up of an international clean development fund to finance emission abatements in developing countries. Developed countries with emissions higher than their ceiling would have to pay at the rate of us $10 per tonne of carbon emitted. At the Berlin Summit the only concession that the North was able to extract from the South was a green signal to begin joint implementation on an experimental basis till 2000. The exchange mechanism for emissions trading, to be established later, depends on the success of the pilot phase of this programme. The concept of joint implementation ( ji ), outlined by Norway in the early 1990s, revolves around the idea that reducing emissions in industrialised countries would be more expensive than in developing countries. The way out, accordingly, is to develop North-South cooperation programmes. However, there are several serious problems with ji. For one, it is likely that industrialised countries would leave developing countries in the lurch. Moreover, developing countries may have to compromise on their sovereignty, import costly technology, and compete amongst themselves to get projects - not an agreeable solution. The us and several international agencies have recently been pushing an approach that combines ji with emissions trading. Under such a scheme, an agency like the World Bank could work with developing countries to prepare a portfolio of projects which industrialised countries can pick from, pay for the extra cost incurred in saving co2 , and take credit for it. Those schemes which offer the cheapest co2 reduction would obviously be the most likely to be chosen.